GOVERNMENTS DENIED IT PUBLICLY AND OTHERS CALLED US "CONSPIRACY NUTS." 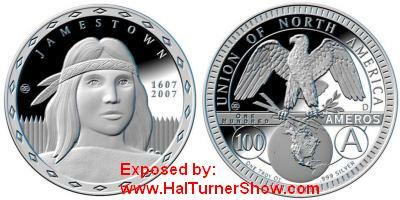 "The Hal Turner Show" has received images of the new unit of currency they are planning. 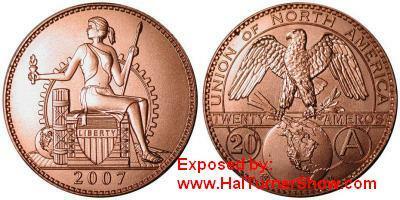 It is called "the Amero" which will replace the "Dollar" and the "peso" in all three countries once they are merged out of existence! 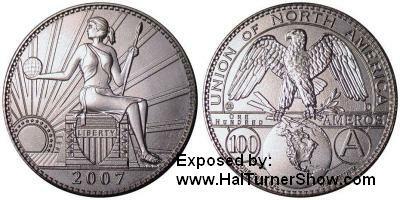 They are even coining "Ameros" in Collectable precious metals like Silver as the "Proof" coin shown below!! More details are pending. One thing is absolutely clear: The governments of the USA, Canada & Mexico are engaged in a conspiracy to merge the three countries without the knowledge or consent of "The People." In furtherance of this conspiracy, the government of the United States is intentionally spending the nation into absolute, unrecoverable Bankruptcy with the intention that the monetary system collapses. When the U.S. currency collpases, it will take with it, both the Canadian dollar and Mexican Peso because both countries are so heavily invested in the U.S. dollar through trade with the US. During such a collapse, when hundreds of millions of average citizens face absolute destitution because their currencies have been wiped out, these Conspirators will turn to 'The People" of each nation and say "your only hope is to merge all three countries and make a new start." The thinking is that the populations will rush to embrace the merger and forget all about our individual history, rights and systems. In one fell swoop, the Conspirators will clobber us into absolute despotism and we will be helpless to do anything because our money will have become worthless! Gee whiz, this plan seems awfully far along. I guess this means the collapse will be this year? Maybe that's why the housing market was allowed to "tank?" Maybe that's why the Stock Markets are dropping hundreds of points per day lately? Maybe this is why oil has increased in price. . . . because the oil nations already know they're going to take a bath on the currency change when they have to exchange "Dollars" they're already holding which will be worth only "pennies" on the "Amero?" Are you starting to grasp why so many things are going wrong lately? Does a lot of it start to make sense when put in the context of wiping out currencies in the name of globalization? It's the jew bankers, folks. Another jew banking scam designed to enrich the few at the utter devastation of the rest! This is betrayal folks! Betrayal by our highest elected officials! Deliberate, intentional despicable deceit! This is EVIL treachery on such a massive scale that the only proper response may be to simply KILL everyone involved. Additional details are starting to come out and more information will be posted as it becomes available!!! Check back often.